The Audient iD14 is an advanced USB Interface and monitoring tool, compact yet powerful, with a versatile set of applications that make it the ideal addition to your studio. The iD14 is a 10-in, 4-out USB interface, equipped with 2 Class-A Audient Console Mic Preamps and a Discrete JFET instrument input. 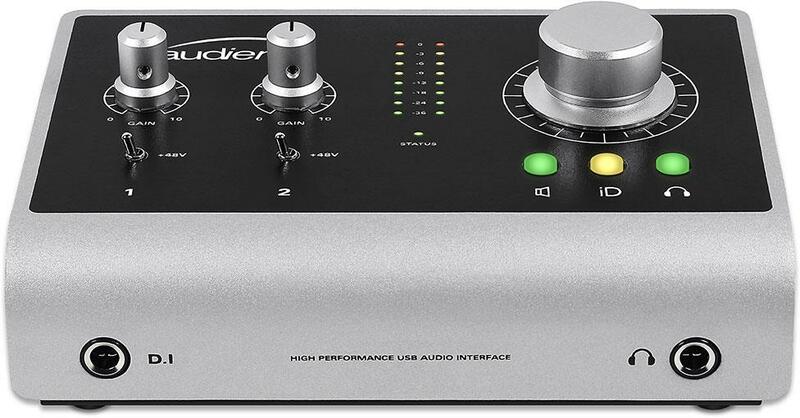 Its high-performance Audient AD/DA converters produce 24-bit/96kHz audio with 116dB of dynamic range, retaining every small detail of your recording with unparalleled clarity. On the rear face, 2 combo mic/line inputs with additional +48V Phantom Power accommodate condenser microphones. These high-quality mic pre's are powered by Audient Class-A mic preamplifiers, used consistently throughout the entire audient range. Boasting a wide gain range of 70dB, low noise floor and low distortion, the Audient preamp offers a "faithful reproduction of the source with just enough colour to give it some character". Accessible via the front panel the ID14's JFET D.I input accommodates the immediate plug and play of various instruments including guitar, bass, piano and more, intended to replicate the sonic qualities of a classic valve amplifier. When your recording demands grow, use the iD14's optical input connector to connect up to ten inputs via an eight-channel mic preamp such as Audients own ASP800. A priceless tool when the necessity to record drums or a live band arises. Audient pride themselves on the versatility and functionality of their interfaces, and for good reason. The iD44 features monitoring features assignable to the iD button found below the encoder wheel. DIM, CUT, Reverse, MonoSum, Polarity Reverse, Cue Mix and Talkback monitory can all be assigned to this button. Furthermore, the ID44's 'Scroll Control' feature gives you hands-on control of your software with the touch of a button. Turn the Encoder wheel into a scroll wheel for your DAW and adjust parameters, scroll libraries and even apply automation. The included mixer app is a simple and intuitive mixer display that gives you a clear platform to set up and record. Audient have ensured a superb integration between their hardware and software, giving you a no-hassle option to record efficiently. New to Audients range, the iD14 arrives equipt with Audients new creative hub ARC. Exclusive to Audient customers, ARC gives you access to a vast array of software worth over 500GBP when you register your product. This amazing offer includes industry-giant software and plugins such as Cubase LE + LE2, Eventide plugins (worth over 350GBP), 10 free LANDR masters (worth over 120USD) and even two free Producertech courses and a 20GBP voucher to help you develop your skills via their comprehensive online courses. -We are the only company that use the same Class-A mic pre design throughout our entire product range, whether you're in the studio with an Audient console or on the road with iD14, you're always guaranteed the same world class Audient sound. -Developed by design legend David Dearden and optimised over 18 years of refinement, our mic pre is used by thousands of professional studios around the world. With its versatile nature and smooth tone, the iD14 will quickly become your 'go to' mic pre. -iD14 provides you with high performance AD-DA converters from Burr Brown, the leaders in converter technology. Quality in the analogue stages of design comes from years of experience as analogue console designers, and when coupled with outstanding converter technology it enables you to hear audio as it's supposed to sound. The importance of converters should never be underestimated. Experience audio the Audient way. -We understand the need to keep things simple and iD14's mixer app was designed with that in mind. Whether you're creating low latency cue mixes or utilising the flexible monitor control, iD14 tightly integrates the hardware and software making the recording process easy. Enabling you to concentrate on what's really important - the music. -Get hands on control of your software with iD14's ScrollControl. 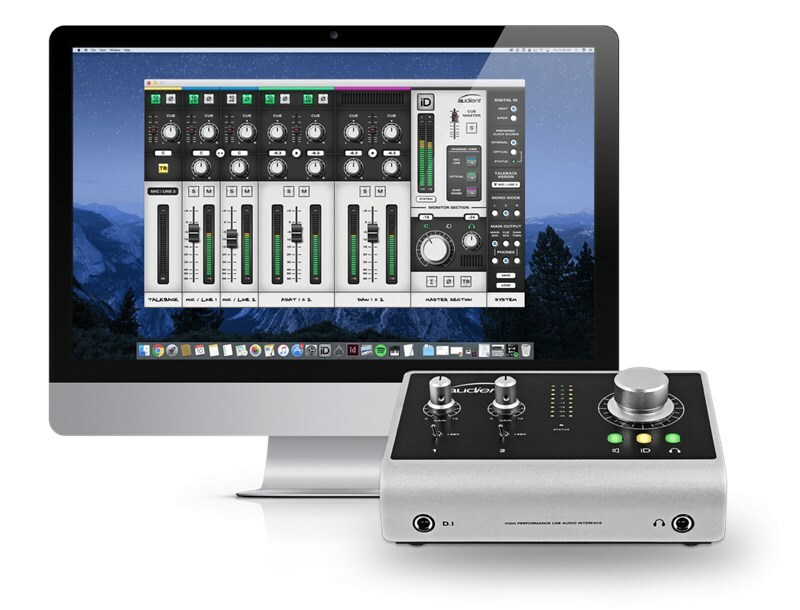 With a touch of a button iD14's volume encoder becomes a virtual scroll wheel that allows you to adjust DAW hosts, plug-in parameters, iD14's mixer app and even scroll through your iTunes library - just like you're adjusting a piece of hardware. Wherever your mouse pointer hovers, the iD knob can scroll to control! -It gets even better! When not using the virtual scroll wheel, the iD button can be assigned to control iD14's monitoring features. Following in the footsteps of it's critically acclaimed big brother iD22, we've still included DIM, CUT, Polarity Reverse, Mono Sum, Talkback and Cue Mix monitoring, all of which can be assigned to the iD button. -Need to track drums? No problem! As your system grows, iD14 can be expanded via the optical input connector, supporting both ADAT or S/PDIF. Enabling you to expand up to ten inputs via an eight-channel mic pre, such as the ASP880. -iD14 has been designed to last, from its all-metal construction, hand finished aluminium knobs and high grade component selection, iD14 will stand up to countless late nights in the studio and days on the road.